Violinist Jenny Grégoire was recently appointed as the full-time instructor of violin at The University of Alabama. Born in Québec, Canada, Grégoire began to play violin when she was five. At age six, she was admitted in the pre-college division of the Québec Music Conservatoire where she studied with Jean Angers and Liliane Garnier-Le Sage and earned both undergraduate and graduate degrees in violin performance and a minor in chamber music. 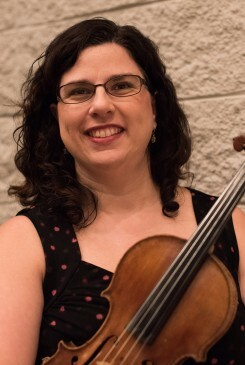 Upon leaving Québec, Grégoire attended Northwestern University, where she received a Master’s degree in Violin Performance and Pedagogy with Dr. Myron Kartman. She was also a member of the Civic Orchestra of Chicago for two seasons and worked with conductors Cliff Colnot, Mistlav Rostropovitch, Neemi Jarvi and Pierre Boulez, among others. One of the highlights of her tenure with the Civic Orchestra was a performance at Carnegie Hall in March 2000, under the direction of Maestro Daniel Barenboim. Grégoire left Chicago to play one season with the New World Symphony, a professional training orchestra under the direction of Michael Tilson Thomas, in Miami, FL. The following year she was appointed concertmaster of the Mobile Symphony Orchestra and she has been holding this position since 2001. Jenny Grégoire is extremely sought-after in the southeast, as she is also concertmaster of the Tuscaloosa and Meridian Symphony Orchestras. In addition to her orchestral career, Grégoire remains active as a soloist and recitalist. She was first featured as a soloist with the Mobile Symphony Orchestra in 2002 in Vaughan Williams’ Lark Ascending. In 2004, she was invited by Maestro Speck to give the Southeastern premiere of the Fantasy for Violin and Orchestra by Kenji Bunch, a rising young American composer. Since then, she has appeared numerous times as a soloist with the Mobile Symphony. In April 2012, Grégoire performed Zigeunerweisen with the Meridian Symphony, under the direction of Robert Trevino. In 2006, she founded in collaboration with the pianist Konstantza Chernov the duo “Jouvence” and since then, the duo has performed in New York, Alabama and Mississippi. Grégoire can be heard on recording in a duo by Koetsier with the renowned tubist Michael Forbes, under the Summit Records label. Jenny Grégoire is very involved as a teacher. She served on the faculty of the Milwaukee Chamber Music Festival for two summers and in 2011, was invited to join the faculty of the National Music Festival. Grégoire also maintains a successful private studio through the Community Music School of the University of Alabama. She regularly acts as a judge and leads sectionals for the Alabama All-State Festival. In June 2014, Grégoire began her eleventh season with the Eastern Music Festival, where she plays in the faculty orchestra (as the assistant principal second violin), performs in the chamber music series and teaches violin and chamber music. She resides in Tuscaloosa, Alabama with her husband, euphonium soloist Demondrae Thurman.